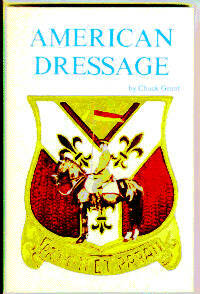 AMERICAN DRESSAGE II by Chuck Grant. at The Washington International Horse Show. This three tape video series is concentrated information, presented with patience and clarity, to allow you to accomplish your ultimate goals in training and riding your horse.Each tape is one hour long. 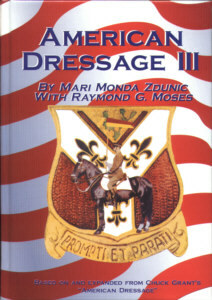 BASIC DRESSAGE - As Good As You Want To Be: Training for both horse and rider through level four. Covers three walks, three trots, three canters, the leg yield,two-track, suppleness and flexion, frame and pace, over- stride,transitions including flying lead changes, how to approach each task and how to accomplish it. ADVANCED DRESSAGE - You Can Do It All:This tape works toward maximizing your horse's talent from PrixSt. 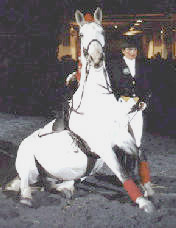 Georges through Grand Prix de Dressage. We focus on becoming more precise at each of the movements learned earlier plus advanced lead changes including every stride, passage, piaffe and pirouettes. Highly recommended for beginning riders to show them where they are trying to go and for advanced riders to help them get there. 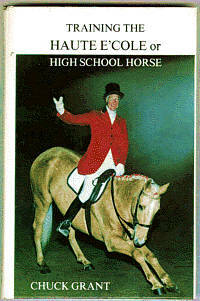 HAUTE E'COLE - Havin' Fun With HighSchool: This is a patient and efficient guide to high schooling your horse. Would you like your horse to kneel, bow, to sit up,lay down, say yes or not, Spanish Walk or cross it's legs? How about a circus bow, camel stretch, head stand, pedestal stand or "Hi Ho Silver" rear? All the tricks named above are gently taught in this program.